The Galileo Technic program investigates mechanical systems from a real engineer’s point of view. The program focuses on finding solutions using teamwork in order to build complex machines. Children will explore the mechanical, mathematical and physical aspects of machinery and the logic process that goes into building them. 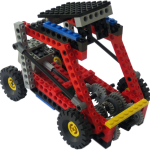 The main goal of the Galileo Technic enrichment program is to provide children with theoretical knowledge on the basic principles of mathematics, science and engineering using motorized LEGO® and other methods that produce motion. The program also aims to train children to solve practical riddles. 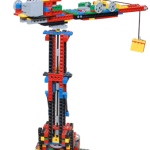 The highlight of each lesson is the building stage of a model that demonstrates the lesson’s subject using LEGO® bricks. Each participant receives our unique Young Engineers kit which has been designed and manufactured especially for this purpose. Basic and complex mathematics: instructors teach basic math, from addition and subtraction to exponents. Powers and principles in physics: centrifugal and centripetal forces, the power of inertia, potential energy, kinetic energy, action and reaction law, buoyancy, torques, fulcrum, load division, angular momentum, and more.Archimedes, Sir Isaac Newton, Einstein, and more. © Copyright 2008 The Decade Group - Young Engineers LTD. Toate drepturile rezervate. 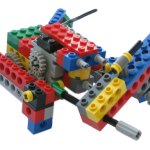 LEGO®, K’nex® si Engino® sunt marci de companii inregistrate care nu sponsorizeaza, autorizeaza sau sprijina aceste programe sau acest website. Acest website este administrat de francizorul Young Engineers Bucuresti Centru Romania.